Buy Any Stack, DOUBLE Your Order! The BEST Bodybuilding Supplements on the Planet! Do you need to build muscle, quickly? 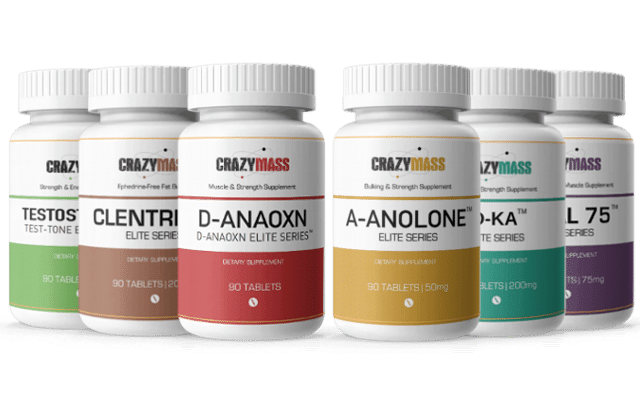 It’s all in our unique CrazyMass formulas and the combination of the highest quality of All-Natural Bodybuilding Ingredients to serious gainers that have trusted us since 2006! Bulk up, get shredded, and achieve the results you want! Our all-natural bodybuilding supplements are manufactured in an FDA registered facility in the United States. Maximize your gains and get jacked in as little as 30 days with CrazyMass supplements. Choose from some of the best stacks and bundles for the ultimate combo package for bodybuilders! GET HUGE AND SAVE LIKE CRAZY! GET STRONGER AND BIGGER, FAST! Buy Any 2 Get Any 1 FREE! Customize your choice of three CrazyMass supplements for the price of two. Cut, bulk, and enhance your strength and stamina with our 100% All-Natural Bodybuilding Supplements that REALLY work. Get Big, Get Cut, and Get Ripped! Shop the Best All-Natural Bodybuilding Supplements on the market designed to deliver the knock-down performance to any competitor. Choose from our portfolio of stand-alone bottles to custom designed performance stacks, all formulated to deliver awesome CRAZY results in as little as 30 days! All of our supplements are safe, powerful and All-Natural. All made right here in the USA. From cutting fat and gaining rock hard abs to bulking up and increasing body mass, we have the muscle building supplements for you! THE ULTIMATE STAND-ALONE MASS BUILDER! DHEA Supplement: What Is It & What Are The Benefits? Meet our dedicated athletes and serious bodybuilders with goals that can’t be achieved by average workouts, nutrition, or supplementation. Team CrazyMass is about true, iron-clad warriors who won’t settle for anything less than perfection. Follow our team on Instagram and learn their formulas, regiments, and training secrets. * These products are not intended to diagnose, treat, cure or prevent any disease. These statements have not been evaluated by the Food and Drug Administration. These products should not be used by anyone 18 years of age or younger. Use all of our products in conjunction with a well-balanced diet and an intense bodybuilding or exercise program. Seek medical advice before starting any supplement regimen. The domain "crazymass.com" and the CrazyMass brand name is trademarked and is not to be used or copied without expressed written approval. Get Shredded & Save: 20% Off!